Northwestern was christened in 1977 on this page you will see the original press release as well as it convereted into text from the original scans of the release. Now as you read through this fine piece of history be aware that the specifications are of course from 1977 and unlike a certain captain who doesn’t like changes, some things are bound to have changed since the original release. 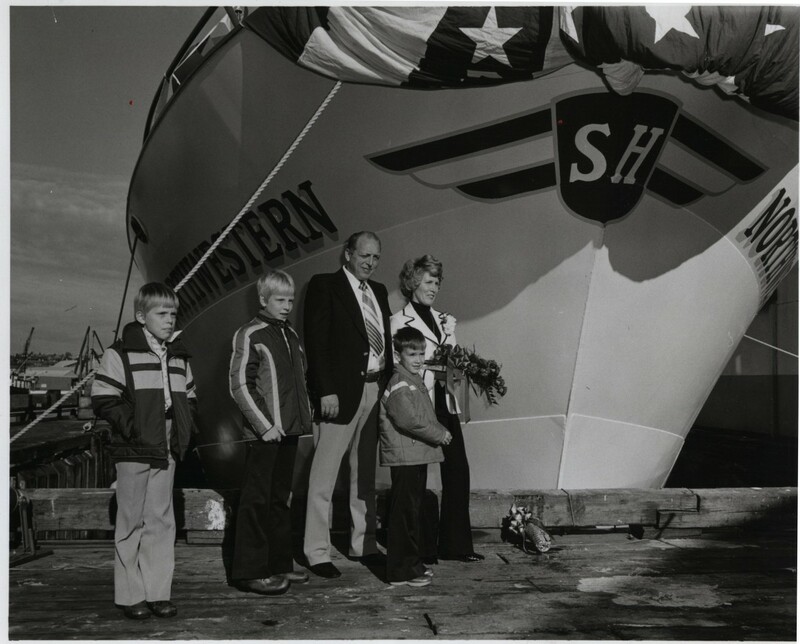 We’ve been asked many times of bringing back more photos and information regarding the “BIRTH” of “NORTHWESTERN”. For you reading enjoyment. SEATTLE — The fourth big crab boat constructed by Marine Construction and Design Co. (MARCO) this year was christened Saturday (November 5) at the MARCO ship-yard on Seattle’s ship canal. 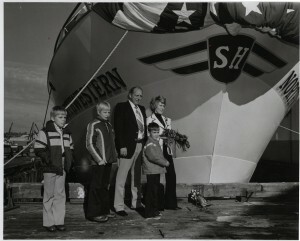 The 108-foot steel vessel was christened “Northwestern” by Mrs. Snifred Hansen wife of the owner and skipper, Sverre Hansen. 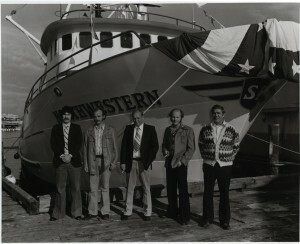 The “Northwestern” is the 44th vessel that MARCO has constructed for Alaskan fisheries since 1968. Five addition boats are on order for delivery starting in January. Following the christening, Hansen will provision the “Northwestern” and make the week-long voyage to Alaska’s crab fishery waters, where the veteran fisherman will fish during the winter months near the Aleutian Islands and in the Bering Sea. Hansen will be delivery his catches to Pacfici Pearl Seafoods in Dutch Harbor. The “Northwestern” has three fish holds totalling 7,500 cubic feet of space to carry 85 tons of live crab in circulating seawater. Propulsion is provided by a turbo-charged and after-cooled Caterpillar D398, producing 850 hp to drive a Coolidge 80-inch 3-blade stainless steel propeller. The vessel has two Caterpillar D3306 auxiliary engines for powering 135 kw generators. Deck and fishing machinery of the all-hydraulic system designed by MARCO includes a MARCO crab pot hauler and pot dumping rack, and an 8-ton Rowe crane and a MARCO boom winch for handling the crab pots and cargo. Power for the deck machinery is transmitted through two MARCO two-pump hydraulic pump drives coupled to the two auxiliary engines. Remote control consoles for operating the crane and boom winches are located on the main deck and on the fo’c’sle deck overlooking the pot storage area. And, a console with controls for the pot hauler and pot dumping rack is located on the fishing deck. Navigation and communication equipment includs to Loran sets, two radars, recording depth sounder, depth indicator, autopilot with gyro compass, four radio and radio telephone sets, and a 4-station intercom. A wagner hydraulic steering sysem includes a wheel plus two jog steering stations. The “Northwestern” is the 27th crabber and crabber/trawler, of 94 to 121 feet in length, that MARCO has delivered for crab fisheries in the Bering Sea and north Pacific. Other vessels MARCO has built for use in Alaskan waters include purse seiners, aluminum seine skiffs, and oil spill recovery vessels.